Glygen’s innovative DNA Purification TopTips enable scientists to purify DNA with excellent desalting efficiency, exceptional recovery, and superior processing speed. The DNA Purification TopTips are innovative micro-spin columns containing Glygen’s proprietary DNAPure weak anion exchange media. 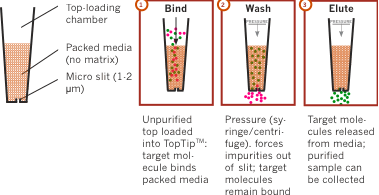 This tip is ideal for scientists developing purification protocols for their DNA molecule(s) of interest, and allows researchers to sample a few tips for DNA purification. Click the button below to add the DNA Purification TopTip to your wish list.